Historically, farming has shaped much of the British countryside, contributed to its beauty and provided a unique way of life in rural areas. Unfortunately, by using pesticides, artificial fertilisers and other intensive farming techniques, industrialised agriculture in this country and across the world is damaging our life support systems – the water, soil, wildlife and climate we need to continue to feed ourselves. As well as producing our food in unsustainable ways, we are also transporting it over long distances. This not only uses energy in transport, storage, and building roads and other infrastructure, but also further stretches our long and complicated food chains, reducing our self-reliance and cutting us off from the seasonal rhythms of our farming climate. 1) Locally grown food tastes and looks better. The crops are picked at their peak, and farmstead products like jams and are hand-crafted for best flavour. Products are processed in nearby facilities and typically the farmer has direct relationship with processors, overseejng quality – unlike products processed in large industrial facilities. 2) Local food is better for you. The shorter the time between the farm and your table, the less likely it is that nutrients will be lost from fresh food. Food imported from far away is older and has traveled on trucks or planes, and sat in warehouses before it gets to you. 3) Local food preserves genetic diversity. In the modern agricultural system, plant varieties are chosen for their ability to ripen uniformly, withstand harvesting, survive packing and last a long time on the shelf, so there is limited genetic diversity in large-scale production. Smaller local farms, in contrast, often grow many different varieties of crops to provide a long harvest season, an array of colors, and the best flavors. Plant and wildlife diversity is also higher where there are many small farms rather than few large farms. Less common varieties are sometimes grown. These reflect local conditions, historical tradition and the individual preference of the grower and are often well worth trying. 4) Local food is safe. There’s a unique kind of assurance that comes from looking a farmer in the eye at farmers’ market or driving by the fields where your food comes from. Local farmers aren’t anonymous and they take their responsibility to the consumer seriously. 5) Local food supports local families. The wholesale prices that farmers get for their products are low, often near the cost of production. Local farmers who sell direct to consumers cut out the middleman and get full retail price for their food – which helps farm families stay on the land. 6) Local food builds community. When you buy direct from a farmer, you’re engaging in a time-honored connection between eater and grower. Knowing farmers gives you insight into the seasons, the land, and your food. In many cases, it gives you access to a place where your children and grandchildren can go to learn about nature and agriculture. 7) Local food preserves open space. When farmers get paid more for their products by marketing locally, they’re less likely to sell farmland for development. When you buy locally grown food, you’re doing something proactive to preserve our working landscape. That landscape is an essential ingredient to other economic activity in the state, such as tourism and recreation. 8) Local food keeps taxes down. According to several studies by the American Farmland Trust, farms contribute more in taxes than they require in services, whereas most development contributes less in taxes than the cost of required services. Apples don’t go to school, tomatoes don’t dial 999. 9) Local food benefits the environment and wildlife. Well-managed farms provide ecosystem services: they conserve fertile soil, protect water sources, and sequester carbon from the atmosphere. The farm environment is a patchwork of fields, meadows, woods, ponds and buildings that provide habitat for wildlife in our communities. 10) Local food is an investment in the future. By supporting local farmers today, you are helping to ensure that there will be farms in your community tomorrow. That is a matter of importance for food security, especially in light of an uncertain energy future and our current reliance on fossil fuels to produce, package, distribute and store food. Remember, however, that sometimes a particular product cannot be grown within the definition “local” due to a number of reasons so this is no reason to shun a product. 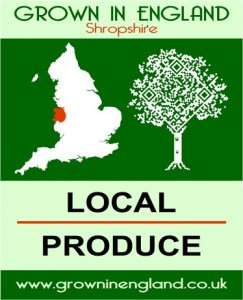 DEFRA advice for buying local There is a need for retailers and producers to make sure labels are clear and effective, and to understand the difference between what consumers care about and what they actually feel able to buy in their weekly shop. If there is a local demand for an item someone locally will see an opportunity and meet that demand. By using the Grown in the UK label on products it is an indication of where the product was grown and by scanning the QR code further information about the provenience can be found. Click the label to find out more about the label ! Popular celebrity chefs are huge advocates for restaurants using seasonal products including Gordon Ramsay and Valentine Warner. In 2008, Gordon Ramsay said that restaurants should be fined for serving non-seasonal food and in September and October 2008, Valentine Warner presented a programme for BBC Two, entitled What to Eat Now, persuading people to consume seasonal food. So if it’s good enough for them, then seasonal food is certainly good enough to us and we hope that the taste will sell it to you too! We started our Sourced Locally initiative back in 2007, and couldn’t be happier with its success. We started out simply selling locally grown asparagus, and now stock well over 2,400 different products from 140 suppliers across Norfolk, Suffolk and Essex: everything from beer, bread and bacon to honey, haddock and heat logs. Our customers are also increasingly buying local, with a 31% increase in Sourced Locally sales and a £12m turnover in the last financial year. This means that since the scheme launched, we’ve ploughed more than £25 million back into the regional economy and supported the creation of around 400 new jobs in the region.